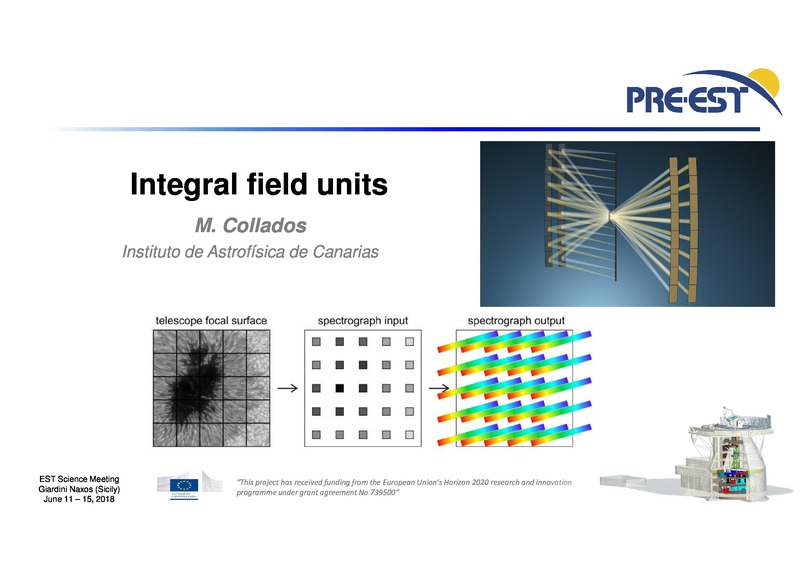 Integral field units (IFUs) represent the most important instrumental development for solar telescopes in recent times. They aim at obtaining the simultaneous spectral/spectropolarimetric information in all points in a 2D field of view at the best achievable spatial resolution. Present IFU developments are based on three different approaches: image slicers, microlenses, and optical fibres. The first two options have been addressed under the EST framework and very promising results have been obtained up to now. Fibre-based IFUs are being developed for one of the first-light instruments of DKIST. In this talk, the three alternatives will be presented and described, putting especial emphasis on the alternatives developed as prototypes of the future EST instruments. A microlens-based IFU has been developed by MPS and tested at the SST. In parallel, a slicer-based IFU has also been developed by IAC and tested at GREGOR. The latter has been offered to all observers at this telescope to gain experience about its performance, stability and data reduction and analysis. These prototypes are fundamental for the final definition of the EST spectrograph(s) and crucial for the science that will be addressable with EST. IFUs will facilitate, v.g., the study of the fast evolution of small-scale solar structures, high-frequency waves, fast acceleration and heating of the plasma, reconnection events, etc. The present status of these instrument developments will be presented, as well as the future steps for their improvement and their final expected performance if/when installed at EST.